Conrad Hanshew6 [Conrad Hanshoe6, Conrad Handschuh2, Conrad Hanshue7, Jacob Hanshuh2]. 1 free white male age 16+ (Conrad). 2 free white males under age 16. See also: Jacob Hinshaw who immigrated to Pennsylvania in 1741 and who might be related. See also: John Hyndshaw whose family lived in Pennsylvania in this same era and who might be related. See also: Moses Hinshaw who was married in Philadelphia in 1777, and who might have been related. See also: Joseph Henshaw whose family lived in Pennsylvania in this same era and who might be related. 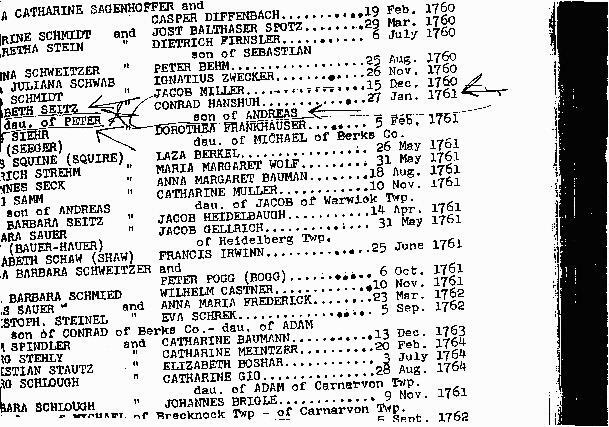 See also: Nicholas Henshaw who was born in Philadelphia in 1705, and who might have been related. See also: Christina Handschuh who might be an additional child (she was married in the same church where others in Conrad's family were married). Contribution from Michael Josef von Goebel (). The Church Of Jesus Christ of the Latter Day Saints (LDS) International Genealogical Index (IGI) - Pennsylvania. 1994, Westminster, MD, Family Line Publications. 1806 court records from Wythe County, Virginia. Contribution from Yvonne (Handshoe) Hall (). 1790 census, Dauphin County, Pennsylvania. Contribution from Steve Hanshew (). Conrad Hanshue last will and testament. Pennsylvania, Tax and Exoneration, 1768-1801; http://www.ancestry.com. 1790 census, Dauphin County, Pennsylvania; roll M637-8, page 170.